As the only Buddhist Animal Advocacy organization in the world, we are uniquely positioned to use the relationships and contacts we have developed in the Buddhist world during the past seven years to make our voice on behalf of animals even stronger. If we aren’t able to reach the one billion Buddhists in the world who will? But, we need your financial support to make it happen. The generous gifts of our supporters empower us to continue to develop innovative projects and actions to spread our message of a compassionate diet around the globe. In doing so we will together save the lives of countless, precious animals. Support for our work is particularly important today in order to realize a matching gift commitment of $95,500, which we just received, and which will expire, from an extremely generous supporter. With our fundraising goal AND 2019 budget at $191,000, we now have a match for the first $95,500 raised which will allow us to reach our $191,000 goal by raising $95,500 and further our message of compassion! Your gift of $25, $50, $100 or more becomes a gift to DVA of $50, $100, $200, or more. 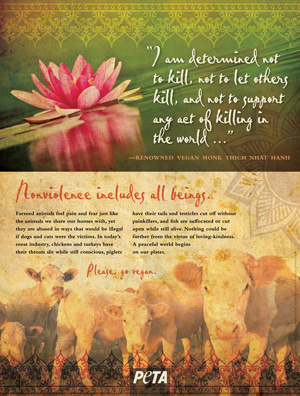 The GIFT you make today will go twice as far to support DVA’s important work in the US, the Buddhist countries of Sri Lanka and Vietnam, and the rest of the Buddhist world by extending the Buddha’s teachings on compassion and non-harming to ALL sentient beings, which will protect the lives of millions, perhaps billions, of animals. * Raised the awareness of many US Dharma teachers, many of whom have become DVA members and donors. * Encouraged the teachers to mention vegetarian and vegan diets during their Dharma talks. * Stopped Dharma teacher training programs from serving animal flesh on their retreats. * Increased significantly the number of plant-based and vegetarian meals served on residential retreats. DVA’s Sri Lanka Project is encouraging the 15 million Sri Lankan Buddhists to transition toward a compassionate plant-based diet. DVA kicked off our Sri Lanka Project on October 26, 2017, with an audience of 600 people, including the national media, at our second annual Asian Buddhist Animal Rights Conference at the Buddhist Cultural Center in Colombo. The Speaker of the Sri Lanka Parliament, Karu Jayasuriya, made a public speech covered by the national media which was extremely supportive of DVA and our mission. On Sunday, September 23, 2018, DVA co-hosted with the VBS (Vietnamese Buddhist Sangha) our Third Annual Asian Buddhist Animal Rights Conference at the 1,000-year-old Phap Van Pagoda (Temple). The VBS oversees Buddhism in a country of 60 million Buddhists. The Director of DVA’s Vietnam Project, the Venerable Thich Thanh Huan, will be using his leadership role on the Executive Committee of the VBS to gain support for DVA’s Vietnam Project throughout his country. When the Conference began more than 500 people and the national press were entertained by singers, dancers, and other musicians. The audience heard the premiere of DVA’s original song called Ăn Chay An Lạc Chùa Pháp Vân (translated into English as Vegetarianism: Happiness, Peace, and Contentment). The song is about the benefits of a compassionate diet. Following the Vietnamese tradition, our song will be performed on the streets all over the country. Here’s our song: https://www.youtube.com/watch?v=XooR-nLKZ7o The Venerable Thich Thanh Huan, DVA President Bob Isaacson, and others spoke about why Buddhists should choose a compassionate diet and about the benefits of a plant-based diet, followed by a delicious plant-based lunch with over 50 food selections. The nearly 15,000 Pagodas in Vietnam gives DVA and its supporters a huge opportunity to talk about the Buddha’s message of non-harming and compassion as we encourage the tens of millions of Buddhists to adopt a compassionate diet. DVA has already influenced large reductions in the amount of animal flesh and other animal products consumed. The GIFT you make today will support DVA’s important work in the Buddhist countries of Sri Lanka and Vietnam, as well as in the US, Europe, and around the world to reduce animal suffering and save the lives of countless, precious animals..
We understand that much of our work needs to be done in Asia where over 98% of the approximately one billion Buddhists live and where seven of our Chapters are located. Since the overwhelming majority of Buddhists live in Asia, the overwhelming majority of the animals killed to feed and clothe them live in Asia. If we don’t do this work in Asia who will? The GIFT you make today will empower DVA to continue to develop innovative projects and actions to spread our message of a compassionate diet around the globe. In doing so we will together save the lives of countless, precious animals. A monthly gift provides a consistent stream of revenue which allows us to best plan our projects. No gift is too small. Imagine a world where Buddhists are setting a shining example for the rest of the world that animals should not be considered food. DVA is a tax-exempt charitable organization under section 501(c)(3) of the U.S. Internal Revenue Code and is eligible to receive tax-deductible contributions. or send a check made out to Dharma Voices for Animals to: PO Box 508; Solana Beach, California 92075; USA.